oh wow! you are so creative! oh wow! you are so creative! now, I must ask, what is tea liqueur? just tea? I actually drink a lot of tea, and I know quite a bit about it, it's much like a hobby for me (like baking), so I always have good tea around. I've tried using it before instead of water, but it didn't seem to affect the bread, so I'm guessing this liqueur stuff is not just straight tea? I saw andrew Zimmerman from bizzare foods eat a bunch of food with tea in it in Taiwan, and It looked really good. I'd love to try cooking with tea. I cannot claim credit for the "creativity." It was MC at Bombance and Farine who gave me the inspiration to use the stencil. 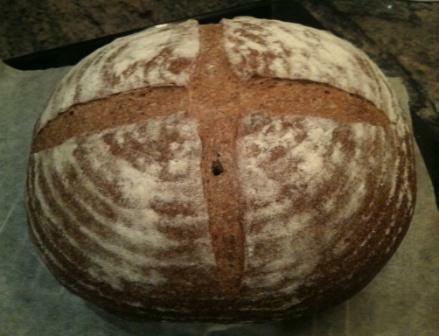 She often incoporates the stencilling in her beautiful designs of breads. The tea liqueur is a liqueur flavored by tea "essence" (which I am not sure is a chemical or a natural tea "extract"). These days you get a lot of fruit flavored "essence" in pastry supply stores; they sell very cheaply, along with stuff like almond essence, orange essence, and the like. You are right that tea doesn't stand out in cooking and baking, unless you make it so strong, which becomes bitter and the flavor is somewhat destroyed. That is why something like "tea liqueur" or "tea essence" is good, but beware, they are more or less about the tea "flavor", not the actual tea. When we want the goodness of tea (ie, detoxing effect, anti-oxidant property, etc), we can only get it from actual drinking of the best tea. That is why I haven't gone all out experimenting recipes with tea. It is a catch 22. The best tea is always subtle in taste, and it is always lost in cooking and baking. So far, what I've found working is the so-called flavored tea - Earl Grey is one best example of flavored tea (there is no such tea tree with that name) because its flavor is strong and won't be lost. That is why earl grey tea is so good in quick breads and, I imagin, muffins. Another flavored tea which has become somewhat vogue in Australia is the Chai tea, which is flavored with heavy cinnamon, cloves, and other spices. Something like this won't be lost in cooking and baking either. But then do we like the taste? It is individual taste, isn't it? ah, well I'd think I'd rather drink tea with my bread ;). Tea lovers like us who also love to cook and bake often fall into the romantic trap that it may be possible to combine the fresh taste into the cooked/baked food. Sorry, I am just speaking about myself. I have had many a failed attempts. And now, mostly I just drink tea as is. On an infrequent basis nowadays, I give my friends Chinese tea ceremony (my euphemism for the procedure) and on these occasions I would make small pastry treats to go with the tea (which is atypical on a strictly classical sense of the "ceremony" - only fresh fruits and nuts are allowed as the smell from cooked food and pastry may interfere with the fragrance from tea, not dissimilar to wine tasting where food is discouraged. Most delightful for me to have come across tea lovers here at TFL. Thank you. I see a lot of recipes today for tea-smoked duck, chicken, and fish. I did a google on "Black Tea Liqueur" but mostly turned up smoky Lapsang Souchong tea. I a big tea drinker, but have never acquired a taste for smoky teas. Would you tell us more about the flavor of your tea liqueur? I would use lapsang souchong. I would use lapsang souchong. I know many don't like it because it literally tastes like you'd think smoke from firewood tastes, but when brewed right, it has a sweet after taste. I think in the US they call it tea extract, but I'm really not sure. Hi Pamela, my tea liqueur is not smoky in taste or fragrance. It is more like jasmin fragrance. This is because in Japan, as well as in Taiwan (and China), the superior tea is never smoked (I don't mean to be rude, but to put it in a crude way, you would not "bastardize" your fresh ingredient if it is of good quality). The cheapest "fresh" (as opposed to "smoke") scent that you can get from tea is jasmin. And therefore, most tea liqueur (or tea "essence") that I've come across has a hint, either strong or faint, of jasmin. But note that jasmin is NOT a tea tree; it is a flower that is often grown near tea plantation. Some CHEAP tea has that scent as a marketing variety for business reasons. Best tea would not have any added flavor or scent, jasmin or otherwise. So, what is the flavor of this Japanese tea liqueur I have? With a hint of jasmin, this liqueur is sweet in taste and very alcoholy. I think you could reproduce this tea liqueur by adding a drop or two of jasmin or green tea essence in a couple of tablespoonful of, say, rum or grand marnier. That's the best I can do to describe it. Based on the foregoing, you can imagine why Lapsang Souchong is not something you would normally find in Japan or Taiwan. I guess that makes sense. Most of the smokey tea I've tried was probably Russian. I'll have to look for some non-Russian Lapsang Souchong. 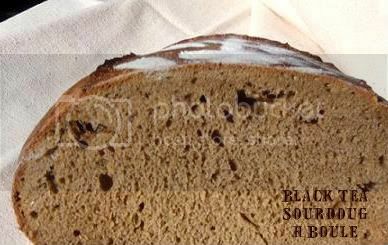 Shiao-Ping, your bread looks beautiful and I'm sure the taste is wonderful! What a great addition to use the tea liqueur! I'm sure there are many this bread would appeal too! I have drank tea nearly every day every since I can remember! 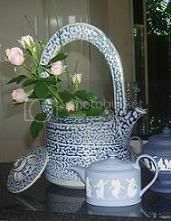 I have heard the Irish consume more tea than China, truely, probably because our cups are so much bigger 'lol' ; ) I use it also in cooking and have two drawers full of tea's. I love the Oolong tea and is one of my favorite, though I drink every morning my English or Irish Breakfast tea. The Queen's favorite tea I have heard is Earl Grey...so I'am sure it scored big points being served as a custard! I have never heard of the 'Tea Liqueur'. I will keep see if I can find some in our local Asian market. It sounds wonderful. I have an older post on here of a dessert where I used tea to flavor the glaze! Lovely to hear from you. I love (running out of words) to meet with other tea drinkers. Drinking tea is a ritual for me every day. My nephew's wife is from Ireland and she loves my Taiwanese Oolong tea too. We often have a "cuppa" together. I would love to read your post of the dessert using tea for the glaze. I will look it up. 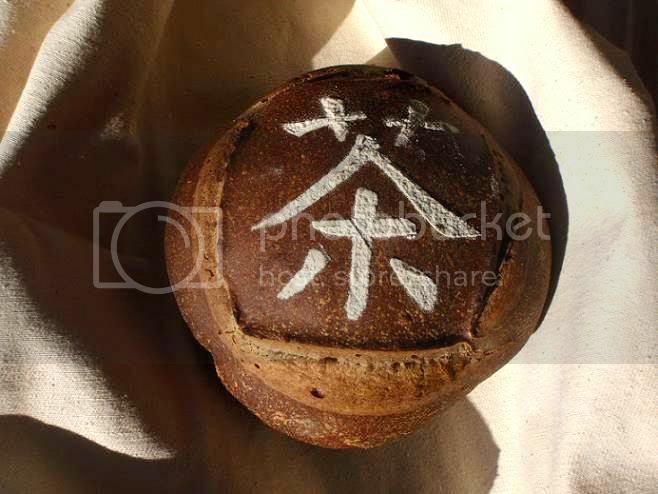 I don't speak chinese, but I recognize the character on the bread. correct me if I'm wrong, but it's the symbol for tea (cha), right? I saw it when I read the classic of tea (which I recommend to everyone). Lovely for you to have recognized the character. Yes, it is "cha." I am big on Chinese tea; no, correction, Taiwanese Chinese tea. I just love to see your "outside the box" ideas. They are all so cool and your presentations are just perfect! ...for your very kind words, Shiao-Ping, but I truly don't think you need a muse for your baking as you seem to be brimming with ideas for new designs and tastes. It is always such a pleasure to read your posts and discover your breads. This one is stunning! I managed to replicate your Black Tea Boule with some success, using my raisin yeast water and following the 75% hydration level of 75% (I've only learnt to work with 100%). I made a mistake with the calculations but luckily caught my mistake just in time before adding all of the levain into the mixing bowl and this is end result. It does not have the beauty and colour of your boule but the taste of tea and aroma from the EG tea leaves (from tea bag) is distinct. The crust is thin and crisp but only while it was still hot, by the time it cooled down it was soft and chewy.